Talking on the phone and texting are some of the leading causes of distracted driving. These actions can be especially dangerous in parking lots where over 20% of collisions and accidents occur. Furthermore, in busy parking lots using a phone or texting while parked can be discourteous to other drivers by disrupting the steady ebb and flow of customers or visitors.For these reasons , our new cell phone parking signs are designed to minimize these hazards as much as possible. 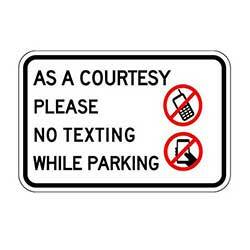 We now offer an assortment of parking signs aimed at maintaining common courtesy and safety in your parking lot.